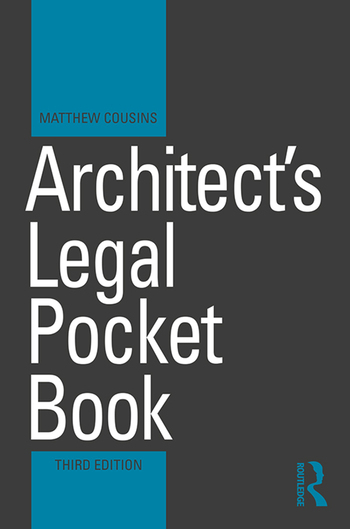 A little book that’s big on information, the Architect’s Legal Pocket Book is the definitive reference guide on legal issues for architects and architectural students. This handy pocket guide covers key legal principles which will help you to quickly understand the law and where to go for further information. Now in its third edition, this bestselling book has been fully updated throughout to provide you with the most current information available. Subjects include contract administration, building legislation, planning, listed buildings, contract law, negligence, liability and dispute resolution. This edition also contains new cases and legislation, contracts including the RIBA contract administration certificates, inspection duties, practical completion, the Hackitt review, the Report of the Independent Inquiry into the Construction of Edinburgh Schools and practical issues facing architects. Illustrated with clear diagrams and featuring key cases, this is a comprehensive guide to current law for architects and an invaluable source of information. It is a book no architect should be without.